Federal prosecutors are pressing forward with additional charges against hundreds of anti-Trump protesters arrested for rioting during President Trump’s inauguration, but many of the defendants are complaining, whining and vowing not to cooperate with the government. Those defendants are now committed to a “Points of Unity” statement, pledging not to cooperate, as if their actions of rioting were innocent. Only two of the 200-plus people arrested during the inauguration protests had pleaded guilty by the time a grand jury returned an indictment that featured a string of new felony charges in late April. In the weeks that followed, six more defendants struck deals with the government. For many others, though, the higher stakes have deepened their resolve to fight the charges. 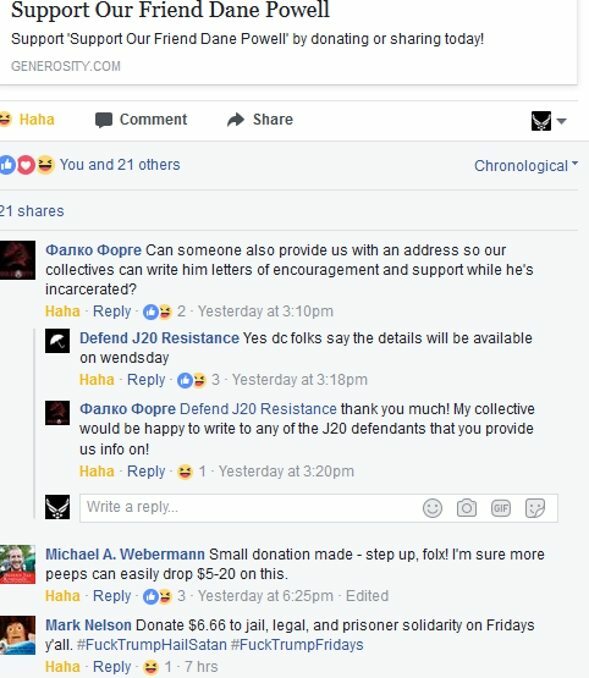 More than half of the 207 remaining defendants are now committed to a “Points of Unity” statement, pledging not to cooperate, to reject plea deals that would hurt other defendants, and to share resources and information, according to Kris Hermes, an activist providing legal support and handling media for defendants committed to the pledge. The number of defendants who have signed on has ticked up since the new indictment came down, Hermes said. The severity of the latest indictment is expected to test the strength of that pledge long-term, however. The defendants at a minimum face eight charges for rioting, conspiracy, and property destruction — most were previously charged with just one count of felony rioting — and are staring down maximum prison sentences on each of the charges that, if combined, stretch several decades. Police in Washington arrested more than 200 people during an “anti-capitalist, anti-fascist” demonstration in Washington the morning of President Donald Trump’s inauguration. Many marchers dressed in black and covered their faces — a tactic police have described as a “black bloc” — and some broke the windows of stores and cars. The arrests also swept up journalists and legal observers. For the most part, those cases have been dropped by the US attorney’s office. A civil lawsuit challenging the legality of the mass arrests and the use of force by police on Jan. 20 is pending in federal court in Washington. Of course, they hold no remorse and hate Trump with a passion with some of their posts captured on their Facebook page. Defendants who spoke with BuzzFeed News were careful not to criticize those who took plea deals or were considering it. Olivia Alsip, one of the defendants who has signed onto the “Points of Unity,” said the defendants hope to leverage their numbers not only to try to convince the government to drop the charges, but also to help secure favorable plea deals for co-defendants who decide to go that route.